If a vehicle is refusing to start but it needs to be moved, a car dolly can be used as a method of moving it around. They act as wheel skates and once you have jacked each wheel onto a dolly, it is far easier to move the car to where it needs to be. The best car dollies are the Go-Jak G6313 dollies that can hold an impressive 1,574 LBS each. They are also compatible with tires up to 13 inches wide that are rated at 6,000 LBS and can be sold in pairs or all 4 dollies for each wheel. Using a car dolly is the safest method of moving cars compared to dragging the car with a floor jack because its so easy for the jack to slip and damage the car. Car dollies are heavy duty and can withstand thousands of pounds of the cars weight on each axle. Always avoid using furniture dollies that are often made of wood because these will simply break and potentially cause damage to the car. There are two types of car dollies, which are the hydraulic and standard. The hydraulic car dolly you will not need to jack the car up but use a pedal to pump the car wheel in the air. The standard car dolly requires you to jack the car onto it. The main difference between the two types is the price, where the hydraulic wheel dolly is much more expensive. Below is a list of the best car dollies to buy for making moving your non running car much easier. These car dollies are made with the highest quality materials and over engineered to make moving cars that much easier. Small things such as the casters being pre-lubricated to the 5 degree offset pedal for additional foot-to-tire clearance are examples of great design. GoJak G6313 are the ultimate car dollies for those that have no budget as such and want the best money can buy. They are the best car dollies and can double up as trolley jacks with the safety locks and the build quality will ensure they are long lasting. For storage, GoJak offer an additional rack that are suited for these wheel dollies, which keep them tucked away safely. 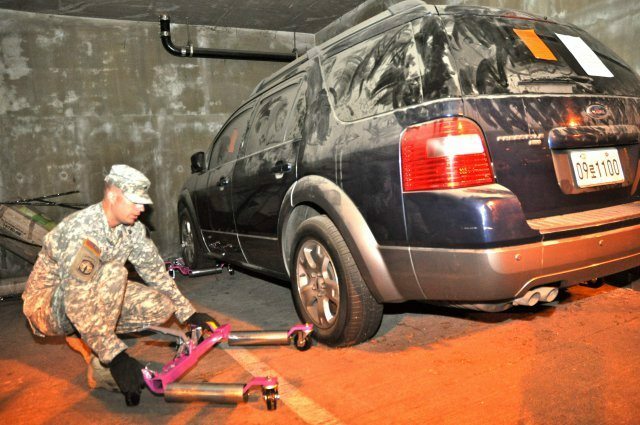 The Pentagon Tools car wheel dollies are by far the most popular due to their affordability and heavy duty build quality. They are sold as a pack of four and require very minor installation of the ball bearing wheels. Compared to many of the cheaper alternatives, these car dollies are heavy duty and have even been powder coated rather than painted. This prevents any chips or scratches appearing when being used around the garage. Another clever feature of the Pentagon Tools wheel dolly is the integrated hole at the top. This makes them far easier to store when not in use. Overall, they are the best car dollies for the money and will be long lasting with the heavy duty construction. For those wanting a hydraulic car dolly, Capri Tools is an excellent choice. They enable you to jack up your vehicle with ease using the foot operated pedal and each wheel dolly has a maximum weight capacity of 1,500 LBS each. Using this car dolly is fairly simple and can be used to fit a range of different wheels using a screw to adjust the width. Once the wheel is lifted in the air after pumping it up, there is a safety pin that locks it in place to reduce any risk of the car dropping. Overall, the Capri Tools 21085-2PK are the best hydraulic car dollies and although fairly expensive compared with alternatives, they are a worthwhile investment. However, compared with similar hydraulic wheel dollies, they offer good value. The Omega 47020 are clever car dollies that can hold vehicles by the wheels, pinch weld or by the frame by adjusting in shape. It is a really nice bit of kit that would have taken many years or research and development to produce. Overall, they are the best heavy duty car dollies that are able to intuitively adjust to hold the vehicles weight in 3 different ways. However, they are on the expensive side for a standard car dolly but the additional weight capacity makes it worth the money. The Merrick Machine Car Dollies are an alternative to the Pentagon tools wheel dolly that can also handle 6,000 LBS using all 4 dollies. It is an all steel construction and are very heavy duty dollies that can move the majority of vehicles. These are similarly priced compared with the Pentagon Tools alternative but does lack some clever features. For example, there is no easy method of storing these wheel dollies but apart from that, they are a great set of car dollies. Car dollies are the one garage tool that always gets missed out when you are building the ultimate garage. Until you have had to move a non running car for the first time, you will not understand the benefits of owning a set of car dollies are. The main benefit is of course the ease of moving any car by yourself. They travel on the casters and can be left on the dollies for months on end. All car dollies are built to be heavy duty and last many years, so when you buy your first set, think of them as an investment rather than something that you may only use once. Many people may not of heard of a hydraulic dolly and only know of the standard style. The benefit of using a hydraulic is that you do not need to use a floor jack to get the wheel onto the dolly. All that is required is placing the dolly in place, adjusting it to the wheels width and then pumping the wheel upwards until it is off the floor. They offer convenience and are easier to get the car on and off the dolly. The only drawback is that you must be willing to pay the premium price compared to the standard alternative. Every one of the recommended car dollies above have a weight capacity, which are all over 1000 LBS. The dollies combined will be able to hold the weight of each axle of a car with ease unless you have a heavy truck. Never overload a car dolly because the casters will be the first thing to break from the added pressure of the weight. Once these break, the dolly can become very hard to remove as it will be at an angle (speaking from experience). There are even people that use wooden car dollies, which will have a weight limit of less than 100 LBS and these should be avoided completely. Another important factor other than the weight capacity is the width of your tires. Unless you have large all terrain tires or ultra-wide wheels there shouldn’t be an issue. The majority have a maximum tire width of around 10 inches wide but if you know you have wider tires, be sure to choose car dollies that are suitable. 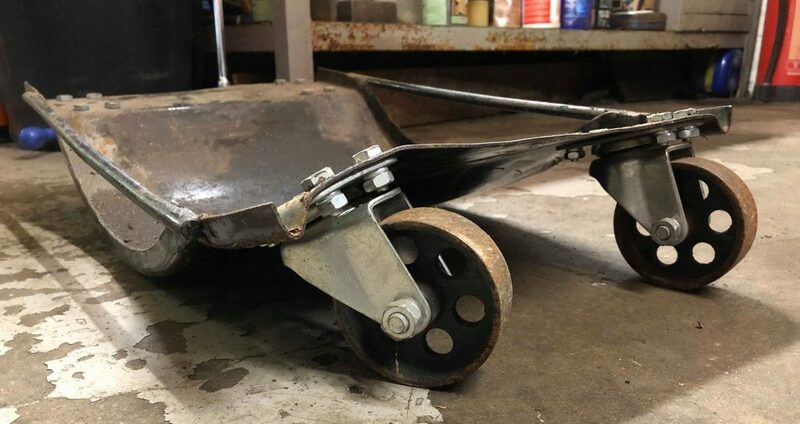 One of the main design features of any car wheel dolly are the casters. These needs to be heavy duty in order to withstand the weight of the car as well as be able to freely move. Ball bearing mounted casters are the best options and allow you to push the car dollies in a variety of directions. Some brands such as GoJak lubricate the casters from the factory but if your car dollies are not, be sure to lube them accordingly. Brakes on the car dollies are a desirable feature and allow you to lock them in place if you plan on leaving your vehicle on the dolly for long periods of time. They are only really found on premium examples but they are a very useful feature. When not in use, car dollies can be fairly difficult to store. However, some come with an intuitive self stacking design or clever features that make them easier to store. Alternatively, you may opt for an additional car dolly rack, which you can safely store the dollies onto when not in use. GoJak offer an excellent rack that are specifically designed for their dollies but you could build a rack yourself to save money. The obvious answer would be to have a set of 4 wheel dollies but you may be on a budget and want to cut corners. However, you are able to get away with just using 2 dollies that are placed on the front or rear axle. This way you can jack the car up on the other axle with a floor jack and pull the car. Of course, this isn’t the most easy options but it will still allow you to move around a car that refuses to start. It may be tempting to opt for a cheaper wheel dolly but the build quality could be questionable. Before upgrading to the GoJak car dollies, our previous set began to bend under long term storage of a car. As you can see in the image below, the wheel dolly bent into the caster, which made it virtually impossible to move, which defeats the purpose of the wheel dolly. Storing your car for long periods is common if you own a small collection or only use the vehicle in the summer. 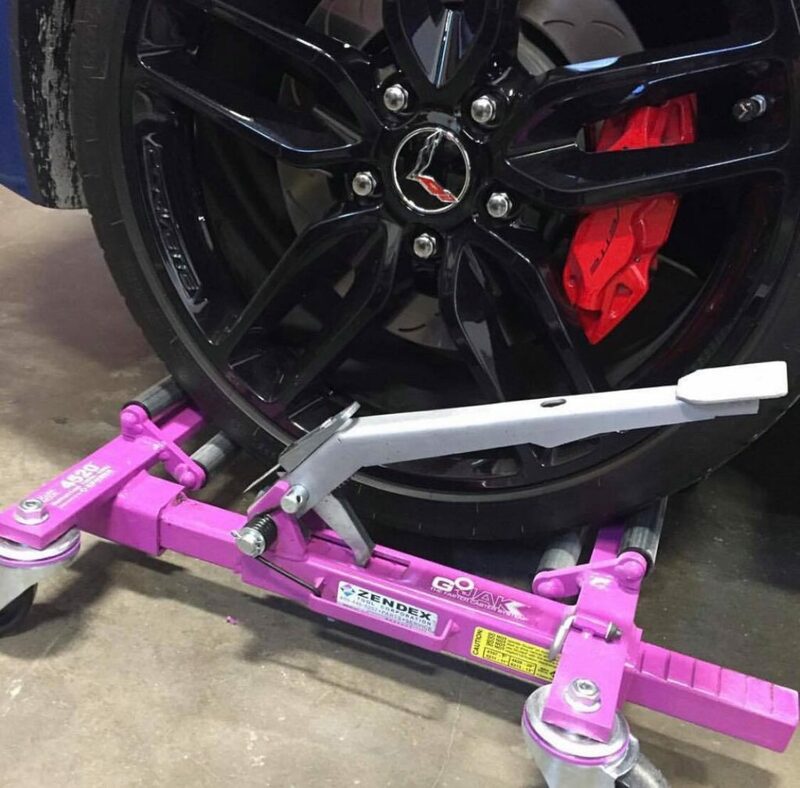 Using car dollies over jack stands for cars is recommended as you have the choice of moving them fairly easily. With Jack Stands, you will need to use a floor jack to lift the car off the stands in order to move them around your garage. Some car dollies even double up as jack stands as they can lift the car off the ground. Car dollies are the best way of moving any non running vehicle. Using floor trolley jacks as a method of moving a car is very dangerous and can cause bad damage to the vehicle. For example, if it were to slip, it could get caught on the side skirts or get dragged across the paintwork. Getting a hydraulic or standard car dolly is completely up to you and they both do the same thing. However, the hydraulic dolly does over convenience and are much quicker to setup but it will leave your pockets feeling empty. All of our recommended car dollies with this article are heavy duty and will easily move non running cars around. The amount you spend on a car wheel dolly is up to you but even the cheapest can make a huge difference.